What are the benefits of life coaching? Remember when you were a child and everything was possible? One of the benefits of life coaching is that it helps you to rediscover the possibilities. Do you set goals and wonder why you don’t achieve them? You're much more likely to succeed when you have someone to report back to on your progress. You can't win the race if you don’t know where you're going! Christian life coaching helps you to train for the race of life. It helps you to clarify your goals and remember where you’re headed and why. The main benefit of life coaching is that it gives you a listening ear and sounding board in a a safe, non-judgemental, confidential environment - somewhere to explore your ideas and get constructive feedback. When you encounter major changes in your life - a new job, a house move, the death of a loved one, or retirement - you face uncertainty and the need to readjust. Friends, family and churches give support and encouragement. A life coach helps you to reassess your life, find new career options, change your lifestyle, get appropriate training, re-evaluate your finances, and find information that enables you to make wise decisions. develop effective ways to keep on improving. It helps you to rediscover your true passions so you can line up your life with what's important to you. explore and evaluate all the possibilities so that you can be sure the path you choose is the best one for you. Coaching will benefit you by helping you to set goals you really want to achieve by distinguishing between what you could do, should do, ought to do and really want to do. When you create an ideal goal - something you really want - you're more likely to take action to achieve it. A life coach works with you to create a step by step plan – a dynamic, workable plan enabling you to achieve your dreams. And gently nudges and encourages you to deal with realities that need to be faced and addressed. Another benefit of having a life coach is that you'll find it easier to identify obstacles and explore strategies to overcome them. Once you've identified the obstacles and developed strategies you'll find it easier to plough through them and achieve your goals. You'll be able to reach for more and maintain a balanced life while doing it. You'll have more time for people and things you value, so you'll feel more fulfilled. A life coach helps you to see what’s working in your life. You'll learn to do more of what’s working so you can have more success and feel more fulfilled. Finding solutions for what isn’t working will help you to press on and enjoy success. You'll be able to identify and overcome limiting beliefs. Coaching helps you to uncover patterns that have kept you from making changes so that you can break free from self defeating habits, successfully pursue your dream and go beyond previous limitations. Life coaching paves the way for lasting change. You'll be able to stick with things until they get done because you have support and encouragement. A coach encourage you to find the courage to give yourself permission to do what you really want to do – it's easier when you have someone alongside helping you to believe in your God given abilities, and cheering you on. If you're ready to explore the possibility of working with me and discover the benefits of life coaching for yourself, contact me and arrange a free - no obligation exploratory session. If you're still undecided, take a look around my website and get a better sense of my coaching style and how coaching can benefit you. You can find out more about how I work and the coaching services I offer, by clicking on the link. 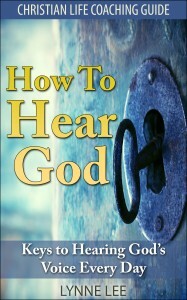 How To Hear God Available in PRINT and on Kindle!! God is a speaking God; He has never stopped speaking to His people. God is continually speaking and He wants YOU to be able hear Him. He isn't a mute stone idol. Contrary to popular belief, God isn't just the Author of a set of rules to be obeyed, or a clever philosophy on how to make life a little better. God is a loving Father whose deepest desire is to have a two-way conversational relationship with the apple of His eye, His beloved creation. It thrills me to know that we have an invitation from God Himself into the sacred privilege of a close, intimate relationship with Him. There is a link to free bonus resources in the book. They're worth way more than the price of the book. I trust that you will be richly blessed.